High Heels —— The Italian fashion house Miu Miu brings us directly to the sea with his new collection of sandals for this spring-summer 2012. Elegant and brilliant sea creatures, in fact, go to embellish many styles of shoes ideal for the summer season. Ultra-flat sandals or heels quite content to meet all our needs for looks, impeccable style and sophisticated, in line with a fashion label that, as with shoes, there just never disappoints. Miuccia Prada knows how to surprise us with solutions looks amazing! The spring-summer 2012 Miu Miu, presented at the fashion shows of Paris Fashion Week in October 2011, is enriched constantly look for new solutions, with beautiful accessories designed specifically to make every outfit our most intriguing and fascinating. And this special line of shoes is the proof. 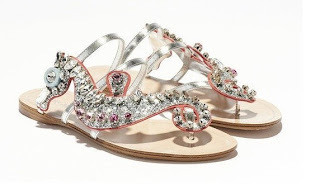 If the fashion catwalks of Miu Miu for spring-summer 2012 have sanctioned a return of the shoe, which is again becoming major players in the female wardrobe, here are the sandals that you want to take their revenge, with creations that leave us in the mouth open: you want to dive into the sea of ​​glass and style of the famous fashion brand Prada group? In our gallery of images, in fact, we take the special collection of Miu Miu shoes dedicated to marine creatures. Several models of shoes on offer, with the little creatures sparkle and glamor that will keep us company in our summer looks the most intriguing, sophisticated and glamorous. From morning to evening, we will be accompanied by really fascinating creatures! The line consists of shoes with heels and without: the ultra-flat sandals are ideal for any time of day, especially if we are to stand a long time or we're going to walk much. Perfect for a day at sea, with our swimwear glamor. Obviously they can not miss even shoes with heels for much more elegant outfits. Never fear, though, because the heights are set, making these sandals very versatile, perfect for every occasion will present itself in this hot weather. Among the animals that we can show off in style at our feet, we have crabs, but also elegant seahorses and even starfish, all creatures that we see in our dive in the most glamorous seaside resort. The animals are then embellished with pink crystals from amethyst, precious stones and lit with glitter details. Prices range from 695 to 890 U.S. dollars. If we consider that are completely hand made, we must admit that they are well worth everyone!